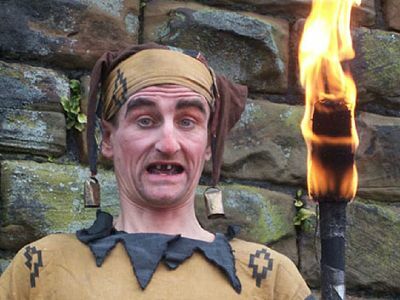 “Tinto” is a medieval street entertainer, fool and the self acclaimed people’s court jester. 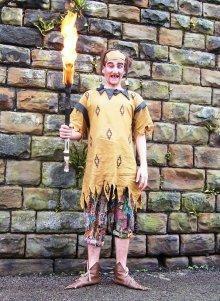 Tinto combines comedy, juggling, unicycling, fire and magic to entertain young and old alike. Available for walkabout events, stage show or table hopping at medieval banquets. 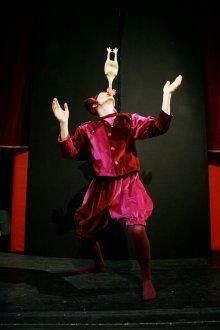 Tinto is performed by Micky, a comic performer with 20 years experience. He is a trained clown, mime and circus performer. 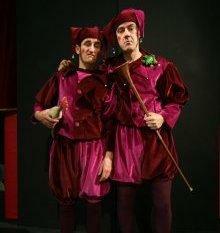 Also available as duo act the Jolly Jesters. Guaranteed to get up to mischief and entertain people wherever they go. The jolly jesters are just as at home with grown ups as they are with children and have lots of tricks up their sleeves. Adept with magic, juggling, unicycling on giraffe unicycles and penny farthings or playing with fire without getting themselves burned. These two will keep you on your toes and make you grin from ear to ear. 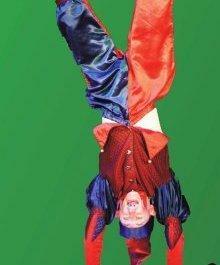 The Jolly Jesters are Micky and Dave, both experienced performers on stage, street and walkabout. Hilarious … I laughed so hard I fell off my toadstool! As mad as a fish but not as slippery! Tinto was fantastic and fitted in perfectly to the event. He met and greeted the guests as they came in with juggling and tricks and then mingled with the crowds later on. Anyway, it was great working with you and I shall definitely think about Contraband for future events. Thank you so much for supplying Tinto he was great!! It was not the easiest of events for him space wise but I saw him getting round all the tables and making people laugh!! I think he was truly professional as is your company and I will be using you again and hopefully Mickey too as I thought he was lovely. I hope he got home OK and thank him from me for a job well done!! I thought Tinto was very good, very funny; he got people up and definitely broke the ice. Thanks for your help in organising him.